A women went into a garage and asked for a 'Seven Hundred and Ten'. 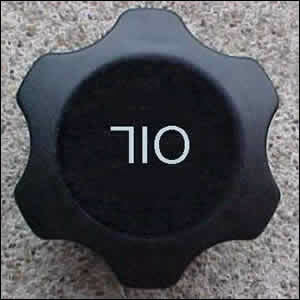 The garage attendant replied, "I've never heard of a Seven Hundred and Ten before, what is it?" She replied, "You know, the little piece in the middle of the engine. I've lost it and need a new one." She admitted that she didn't know exactly what it was for, but she had been told that it was important, and this piece had always been there anyway. The owner of the garage gave her a pen and paper and asked her to draw what the part looked like. She drew a circle and in the middle of it wrote '710'. Still baffled, he took her over to another car which had it's bonnet up and asked, "Is there a 710 on this car?" She pointed and said, "Of course there is, it's right there!"